Housed inside one of the most impressive of Manchester's modern buildings (the former URBIS museum), this four-floor monument to football boasts that it contains the greatest football collection in the world. It’s the permanent home to the FIFA collection, the Football League collection, the FA collection and many more, and it works towards the preservation and conservation of such memorabilia. You can see the 1966 world cup ball and the the Sleeping Beckham work of art by Sam Taylor Wood, Maradona's 1986 'hand of god' match shirt and postcards from 1906 of women football players. As well as temporary loans and exhibitions, there's also plenty of opportunity for play and interaction. A discovery zone for under fives allows kids to dress up and listen to stories. 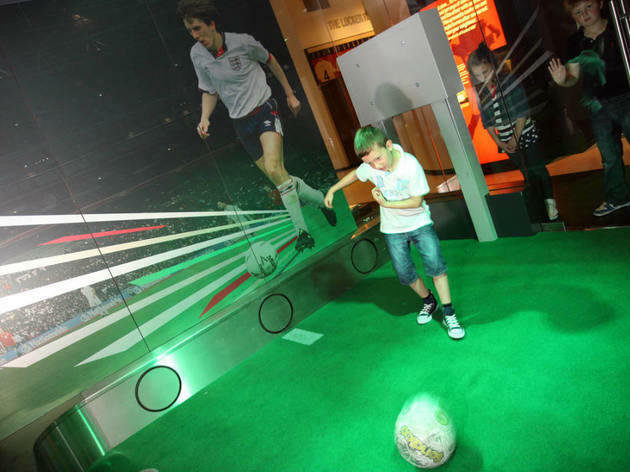 Football + is a series of seven interactive experiences, giving you the chance to test your ball skills and reactions, have your photo taken with a trophy and try your hand at being a football commentator. Back of the net!